Decks refer to the wooden platform that can be seen above ground and connected to a main building. Such additional areas are essential when planning to create outdoor spaces for your home. They are also generally visible in cafes, private homes, restaurants, and in the upper floors of high-rise buildings. Such are commonly called observation decks. The U.S. Department of Housing and Urban Development stated that in 2009, 85% out of a sample of 130 million houses had a balcony, deck, porch, or patio in place. In fact, there were more of them during that time than there was in 2007. This means that such an amenity has been installed to thousands of homes in just a couple of years. It is often challenging to take care and maintain the deck you have at home. But look at the bright side, because this can forestall any unwanted repairs, protect the investment, and boost your outdoor space. Remember that decks can be exposed to external elements each year. That’s why it is very important to consider a routine to upkeep your property so that it can protect and prevent it from expensive repairs in the future. 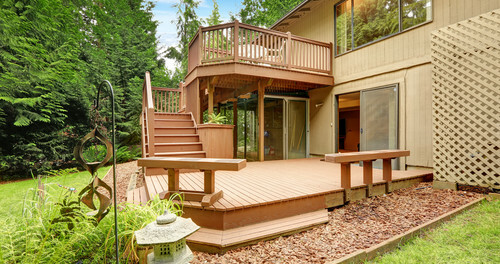 These causes of deck damage can be avoided or dealt with beforehand. Take note that this additional home feature can make or break the value of your home. With a variety of ways to cause this, you should be aware that it can lead to serious injuries in one way or the other. The reason for deck collapse is also common due to damage or improper inspection or fixing. Without following the proper method of building, decks can also get unexpected damages even with proper maintenance. If you are using wood on your deck, you can use a deck cleaner and proceed by following the directions on the packaging. For a composite type of structure, you need to use a specialized formula intended for composite materials. Grease and oil stains can be removed with commercial detergents and degreaser. If you are going to use vinyl, you have to make sure that you only use mild soap mixed with warm water. This will effectively remove dirt, mildew, and mold. Apply toner if necessary in order to add some color. However, do it by fully revealing the grain and providing protection against direct sunlight. You can also use solid stain with opaque color that will seal the damage due to weathering, while completely covering the grain. For more information on building or repairing a deck, contact WICR Waterproofing and Decking today!